October 18, 2017 0 comments on "Wardrobes For Small Bedrooms 2019"
Finding enough space to store belongings can be one of the big challenges when living in a small home. Not only do you have to fit in all the necessary furniture but what about all of the other items like clothes, shoes and bedding. When it comes to small bedrooms and small studio apartments, wardrobes appear to be a luxury that many will go without. If you do not have enough space to fit a solid wardrobe in your bedroom, then fear not because there are a few different types of wardrobe alternatives that you can try out. 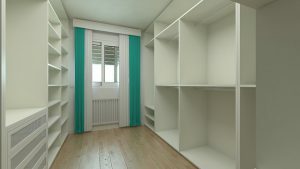 In this article, we will be looking at some of the different types of wardrobes for small bedrooms, to see which one may be the most suitable for your small room. If you would prefer not to buy a wooden wardrobe, then one of these metal closets by Whitmor can be a nice option because they are cheap, easy to put together and sturdy enough to do the job. 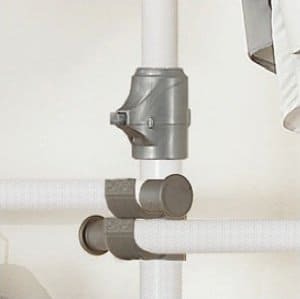 The utility closet is easy to assemble and shouldn’t take more than 15 minutes, however, you may need a rubber mallet to bang the pieces together. The assembled closet will have 5 shelves and two bars to hang your clothes on and will be just as useful as a regular closet. If you are not too happy with your clothes being on view, then you can put the removable fabric cover over it, which zips up to conceal the items inside. The Whitmor Deluxe Utility Closet is a strong and sturdy closet, that is great value for the price. It would be an ideal closet for small bedrooms and small studio apartments. 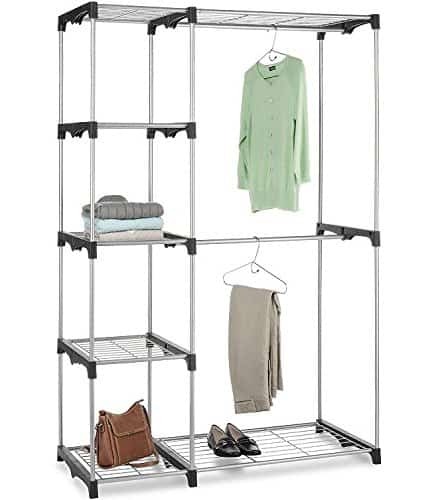 Once more, this is a makeshift wardrobe/clothing rack/closet organizer that will do the same job as a regular wardrobe, however it will use space in your room more efficiently. What we really like about this style of wardrobe is that it uses all of the room, from ceiling to floor. This will be great for small rooms because you get to use the upper area of the room for hanging items of clothes also. The poles are made from steel and assembly is very simple. What’s more, you do not have to worry about it marking your home because it will not damage your floor or ceiling. The spring loaded poles fix solid against the ceiling and the anti-slip rubber feet make sure it remains stable. The closet set is quite large and will hang up to 160 shirts (approx.) and also comes with two shelves for extra storage. One issue we have with this wardrobe is that it doesn’t have a cover, therefore the clothes will be exposed. To get around this problem, we think it would be a good idea to set up a makeshift style curtain or sheet across the area of that room, therefore you can pull the curtains or sheet across the clothes when needed. Once again, this wardrobe for small rooms is another option for people wanting to not only space save by using their small room to the maximum but also save on money by not having to purchase a solid wardrobe. This style of wardrobe is also great for people in transition because it is simple to take apart when moving homes. This closet kit by Rubbermaid would be ideal for people that have a small room that they want to make into a walk in closet. At first it may look daunting to set up, however the instructions are very detailed and simple to follow. It is a well made product that is great value when you look at the impressive finished product. You can arrange the layout of this closet organizer to suit the way you want it to look. What’s more, if you have a lot of clothes, then this closet kit is definitely what you are looking for. 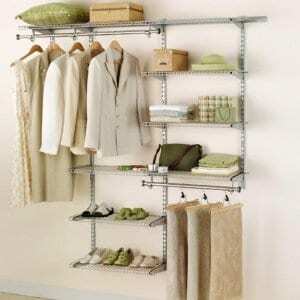 The organizer provides plenty of shelf arms and ample shelf space to hang clothes on, making it ideal for small rooms. The Closet kit can be mounted to any wall, however, assembly is not a one person job. Two people and some tools, like a power drill, will be necessary to mount it to the wall. If you are looking to save on some money instead of buying an expensive wardrobe, then you can maximize your storage space by getting one of these Rubbermaid Deluxe Custom Closet Kit. Before purchasing, have a look at the many reviews on Amazon for this product. If you are looking for a more traditional style wardrobe that will fit nicely into a corner, then The Elite 32″ Wardrobe Cabinet by Prepac could be what you are looking for. 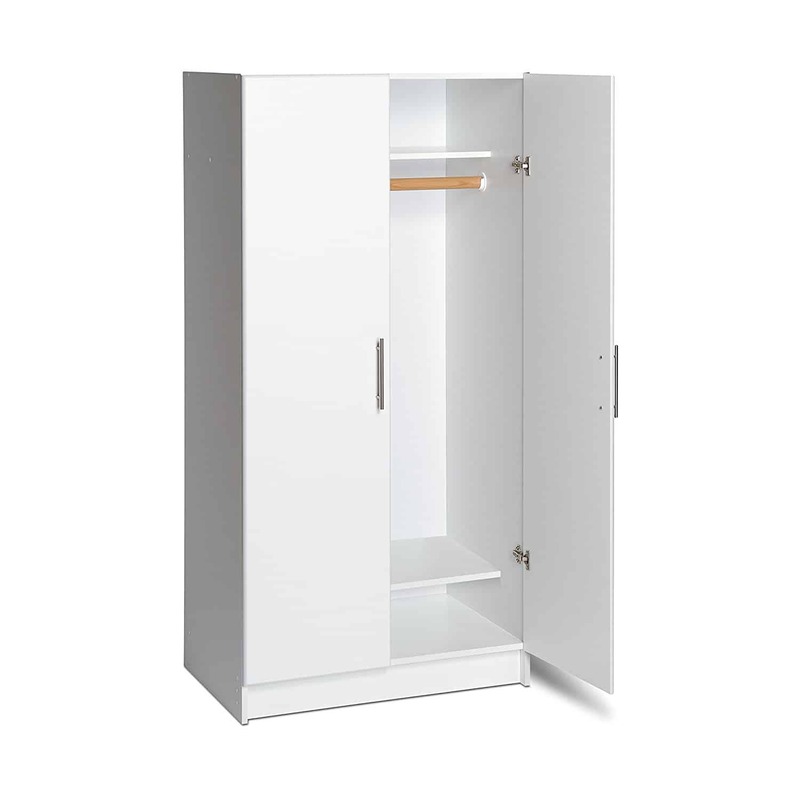 It is a basic wardrobe but at 32″ x 20″ x 65″, it is roomy enough for some good storage space. It is not the largest of closets, however it would be a good fit for a small room or small studio apartment. It is very easy to assemble and looks surprisingly well for the price. It is solid and sturdy and also good value for a wooden wardrobe. The product is pretty heavy, therefore expect a heavy package when it arrives. If you live up a stairs, then carrying the product up piece by piece, will be the easiest way. If you are looking for a sturdy, good value wardrobe for your small home, then why not check out the Elite 32″ Wardrobe Cabinet by Prepac, as a solution to your space saving needs. Finding extra storage space can be quite the challenge when living in a small home, however with the right furniture it can become an easier task. Fitting a large bulky wardrobe can take up a lot of space in a small room, therefore finding one the right size for your small space is important. We hope that you found the closet organizer ideas or wardrobes for small bedrooms in this article to be helpful. Some of them may not be exactly what you were thinking of but we like to think outside the box here at Best For Small Spaces when it comes to making the most of valuable space in small rooms.